The end of the FCS season is upon us and that means we have eight more months of suffering. Everyone put on your sad panda face. I suppose we have signing day, spring drills, summer workouts, and fall camp, but it’s just not the same. What are we going to do until August? Beats the hell out of me, I’ve yet to figure it out. To close out the FCS season we’ll have North Dakota State and Towson meeting up in the championship game in Frisco, Texas. This will be the Bison’s third trip in a row to Frisco, this will be a first time appearance for Towson in the championship game. The Bison, needless to say, are the overwhelming favorite in this game. The Bison are looking for their third consecutive championship. The big news of this game is that it will be NDSU head coach Craig Bohl’s last game for the Bison as he will be taking him and some of his coaching staff to Laramie to coach Wyoming. Chris Klieman will stay behind and remain the Bison head coach next season. The Bison started their playoff run with a victory over Furman, 38-7. 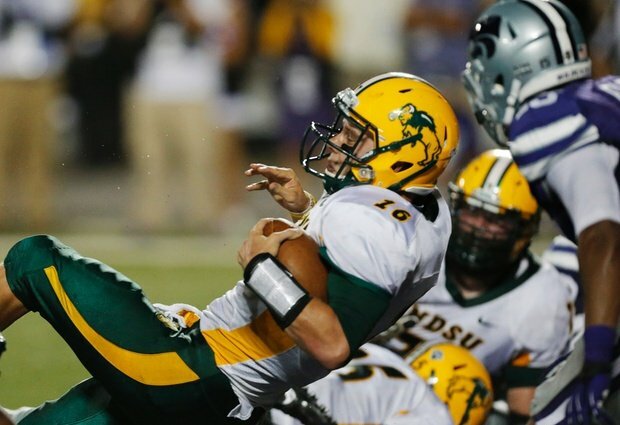 The Bison hosted Coastal Carolina the following week and thumped the Chanticleers 48-14. In the semifinals the Bison once again flexed their muscles and beat on visiting New Hampshire 52-14. The Bison shook off an early Brock Jensen interception return for a touchdown to score 52 straight points on the Wildcats and advance to the championship game. Towson took a much more difficult path to the FCS title game as they started their playoff run by hosting, and beating Fordham. After that the Tigers had to hit the road. In their first road game they faced off with second seeded Eastern Illinois and defeated them 49-39 in Jimmy Garappolo’s final college game. After that they hit the road even further away to Cheney to take on Eastern Washington. The Tigers once again defeated a higher seed, this time 35-31 on the Inferno. Now they get a road trip to Texas to face the #1 seeded Bison. How do these teams matchup? Offensively these teams are very close, Towson ranks 12th in total offense at 472 yards per game while the Bison are 13th at 465 yards per game. The Bison rank 2nd in total defense, giving up 247 yards per game. The Tigers rank 47th in total defense, giving up 368 yards per game. The Bison are led by senior quarterback Brock Jensen who was 205/311 for 2658 yards and 33 touchdowns with seven interceptions. Jensen also rushed for 459 yards and nine scores. Bison running back Sam Ojuri rushed for 1314 and nine touchdowns. The leading receiver for the Bison is Zach Vraa who caught 67 passes for 1153 yards and five touchdowns. The Bison’s leading tackler is Carlton Littlejohn who has 82 tackles on the year, 34 of those are solo. The Towson Tigers are led by running back Terrance West who led the FCS in rushing yards, rushing for 2420 yards and 40 touchdowns. He’s only a junior. West is a premier athlete in the world of FCS and is a force to be reckoned with. The Tigers quarterback, Peter Athens, was 228/353 for 3194 yards and 19 touchdowns, while throwing 12 interceptions. The leading Towson receiver is Spencer Wilkins who caught 40 passes for 691 yards and four touchdowns. The leading Tiger tackler is Telvion Clark, a senior linebacker who recorded 139 tackles, 85 of those solo. Needless to say the defense flows through him. What happens when these two teams lock horns this weekend in Frisco? My guess is not a kind one towards Towson. Three straight road games probably won’t be too kind to the Tigers. The Tigers offense is predicated on the success of Terrance West, and the one thing that the Bison are really good at is stopping the run. In fact they rank first in FCS in rushing defense, allowing 90.2 yards per game, 2.91 yards per rush. Towson is going to have to make it happen in the passing game if they want a chance to score points, or at least open up the rush lanes for West. On the other side of the ball the Bison are a very balanced offensive attack rushing with Ojuri and and John Crockett, as well as Brock Jensen when he needs to. Towson isn’t too shabby at stopping the rush either, ranking 15th, or 121.3 yards per game. And lord knows that being in the CAA they saw their share of good rushing teams, but the Bison will kill them through the air if they can’t run. You’d have to think this will mostly be a home game for the Bison who notoriously travel well. Given the generally modest home attendance (10,000’ish) for Towson I’m guessing it’ll be a 70/30 crowd split in Frisco. Of all of the teams in the FCS playoff field I felt like if there was a team who was going to beat NDSU it was going to be Towson. A lot of other teams looked like definite mismatches, but this one looks like the best bet for an upset. However, I just don’t see an upset here. In Bohl’s final game for the Bison I think they send him out on a high note. North Dakota State 48, Towson 23.